Snakes are a weird evolutionary mystery, and biologists still aren't sure exactly where they came from. Are they the descendants of land-based lizards that evolved away from legs, or did their ancestors slither out of the sea? X-rays of a recently discovered, 95 million year old fossil may go along way to answering that riddle. 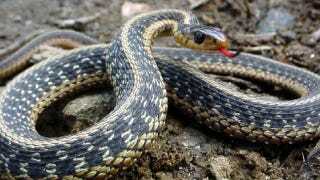 Wherever snakes' ancestors came from, we know that they originally had legs and then lost them over the eons. The problem is we haven't had any real way of telling apart their possible origins through the existing fossil record, so it's very difficult to say with any certainty where they came from. But now French researchers led by Alexandra Houssaye at Paris's National Museum of Natural History have been able to X-ray the 95 million year old fossil of the snake ancestor Eupodophis descouensi. The fossil was discovered about ten years ago in Lebanon, and it seems to represent a midway point between lizards and fully legless snakes. One leg was already visible on the fossil surface, but it didn't offer many clues about its deeper lineage. X-ray analysis, on the other hand, has turned up a second leg that reveals some crucial details. It's bent at the knee and has four anklebones, yet no foot bones. That makes it a dead ringer for today's terrestrial lizards, and it's the best proof yet that snakes evolved from landlubber lizards. Journal of Vertebrate Paleontology via New Scientist.